A technologically advanced complex system of structural lipids, anti-oxidants, and plant-derived squalane in an intensive serum produced by biofermentation techniques. Not An Animal Derived Product! Cera-Sterol® is comprised of Glycoceramides, Sphingolipids and Cholesterol, as well as Vitamin E Acetate, Beta Carotene and plant derived Squalane, ingredients which are functionally important to the human stratum corneum. The aging process, as well as resultant damage caused by washing, stress, environmental insults or excessive UV exposure, cause loss of “Lipids” and replacement of these structural lipids can dramatically improve the skin’s correct moisture balance and protection system. Removing oxygen singlets, which cause premature aging, will further improve the appearance and vitality of the skin. Cera-Sterol® should be used after any exfoliation treatment, including Alpha Hydroxy Acid Treatments, TCA peels, routine facials, and as a final application after a daily skin regimen to “seal” in, and reincorporate moisture which exfoliation removes. Indeed, for any skin type, application by the esthetician after facials, and home use by the client, Cera-Sterol® is more than necessary it is Vital! 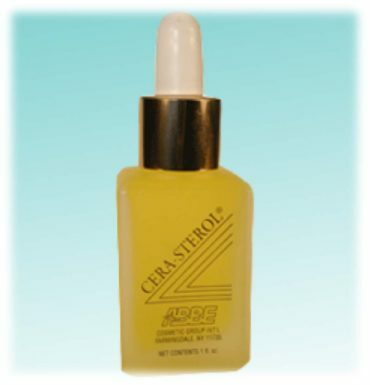 DIRECTIONS:CERA-STEROL® is the final therapeutic preparation to be used in your daily skin care regimen. After cleansing, toning, and moisturizing, apply several drops to fingertips. Immediately apply to face, paying special attention to eye zone, crows feet, and smile lines. You should repeat application if necessary to skin which shows signs of severe environmental damage. You may then apply your make-up. Is a must to be used after AHA or any exfoliative treatment. Use twice daily . KEEP FROM SUNLIGHT.